El crecimiento poblacional y los cambios en el entorno requieren de la disponibilidad de diversidad genética para el desarrollo de sistemas de producción sostenibles, eficientes y competitivos. Esto implica colectar, conservar y conocer los atributos de las poblaciones en mantenimiento de especies de valor actual y taxones relacionados, al igual que entidades biológicas con potencial de desarrollo, lo cual cobra importancia dada la creciente erosión genética. Esto plantea la necesidad de estrategias complementarias de conservación ex situ e in situ, dando prioridad a la variabilidad genética a ser incluida en el proceso, debido a los costos de mantenimiento, y considerar factores no sólo económicos sino también sociales, así como los limitantes actuales para acceder a la diversidad internacional. Este artículo presenta una revisión sobre la importancia de la conservación de los recursos genéticos vegetales, animales y de microorganismos de la agrobiodiversidad, e incluye una discusión y algunos aspectos requeridos para la priorización de taxones y tipo de materiales que se deben incluir en el proceso. Para ello, se parte de la premisa de que la conservación de la diversidad genética sirve para la realización de procesos de valor agregado y de utilización posterior. Ph.D. Investigador titular, Grupo de Recursos Genéticos y Mejoramiento de Frutales Andinos. C.I. La Selva, Rionegro, Antioquia. Profesor Asociado, Universidad Nacional de Colombia, Medellín. Investigadora máster asociada, Grupo de Recursos Genéticos y Mejoramiento de Frutales Andinos, C.I. La Selva, Rionegro, Antioquia. Abramovitz JN. 1994. Trends in biodiversity investments. World Resources Institute, Washington, D.C.
Adams G. 2007. The principles of freeze-drying. En: Day JG, Stacey GN, (eds. ), Methods in molecular biology, Vol. 368: Cryopreservation and freeze-drying protocols, Totowa NJ, USA, Humana Press, pp. 1–14. Andersen NS, Poulsen G, Andersen BA, Kiær LP, D’Hertefeldt T, Wilkinson MJ, Jørgensen RB. 2009. Processes affecting genetic structure and conservation: a case study of wild and cultivated Brassica rapa. Genetic Resources Crop Evolution 56:189-200. Bardsley D, Thomas I. 2004. In situ agrobiodiversity conservation in the Swiss inner Alpine zone. GeoJournal 60(2): 99–109. Birol E, Smale M, Gyovai A. 2006. Using a Choice Experiment to Estimates Farmer’s Valuation of Agrobiodiversity on Hungarian Small Farms. Environmental & Resource Economics. 34(4): 439-469. Brookfield H. 2001. Exploring Agrodiversity. New York, Columbia University Press. Brookfield H, Padoch, C, Parsons H, Stocking M. 2002. Cultivating Biodiversity: Understanding, Analysing and Using Agricultural Diversity. London, The United Nations University, ITDG Publications. Brown AHD. 2000. The genetic structure of crop landraces and the challenge to conserve them in situ on farms. En: Brush SB, (ed. ), Genes in the Field. On-Farm Conservation of Crop Diversity. IPGRI, IDRC. Lewis Publishers, pp. 29-48. Brown AHD, Brubaker CL. 2002. Indicators for sustainable management of plant genetic resources: How well are we doing? En: Engels JMM, Rao RV, Brown AHD, Jackson MT, (eds. ), Managing Plant Genetic Diversity, Oxford, CABI Publishing, pp. 249-261. Brush SB. 2000. The issues of in situ conservation of crop genetic resources. In: Brush SB, (ed. ), Genes in the Field. On-Farm Conservation of Crop Diversity, IPGRI, IDRC, Lewis Publishers. Pp. 3-26. Caballero L, Martin LM, Álvarez JB. 2007. Agrobiodiversity of hulled wheats in Asturias (North of Spain). Genetic Resources and Crop Evolution 54:267–277. Camacho TC, Maxted N, Scholten MA, Ford-Lloyd BV. 2005. Defining and identifying crop landraces. Plant Genetic Resources: Characterization and Utilization 3(3):373-384. Charafi J, El Meziane A, Moukhli A, Boulouha B, El Modafar C, Khadari B. 2008. Menara gardens: a Moroccan olive germplasm collection identified by a SSR locus-based genetic study. Genetic Resources and Crop Evolution 55(6):893–900. Conferencia de las Naciones Unidas sobre el Medio Ambiente y el Desarrollo. 1992. En: Convenio sobre Diversidad Biológica, http:// www.cbd.int/doc/legal/cbd-es.pdf, Consulta: mayo 17 de 2008.
Cooper HD. 2002. The International Treaty on Plant Genetic Resources for Food and Agriculture. Reciel 11(1):1-16. Day JG, Stacey G. 2008. Drucker AG. 2004. The economics of farm animal genetic resource conservation and sustainable use: why is it important and what have we learned? Background Study Paper No. 21. FAO, Rome, 9p. Dulloo ME, Guarino L, Engelmann F, Maxted N, Newbury JH, Attere F, Ford-Lloyd BV. 1998. Complementary conservation strategies for the genus Coffea: A case study of Mascarene Coffea species. Genetic Resources and Crop Evolution 45(6): 565–579. Engelmann F, Engels JMM. 2002. Technologies and Strategies for ex situ conservation. En: Engels JMM, Rao VR, Brown AHD, Jackson MT, (eds. ), Managing Plant Genetic Diversity, Oxford, Cabi Publishing, pp. 89-104. Faith DP, Ferrier S, Williams KJ. 2008. Getting biodiversity intactness indices right: ensuring that ‘biodiversity’ reflects ‘diversity’. Global Change Biology 14(2): 207–217. FAO. 1997. The state of the World’s Plant Genetic Resources for Food and Agriculture. Rome, FAO, 444p. FAO. 1996. Global Plan of Action for the Conservation and Sustainable Utilization of Plant Genetic Resources for Food and Agriculture. Leipzig, 17-23 June, 1996. 63p. FAO. 2001. International Treaty on Plant Genetic Resources for Food and Agriculture. Rome, Italy. Firbank LG. 2005. Striking a new balance between agricultural production and biodiversity. Annals of Applied Biology 146(2):163-175. Fowler C. 2004. Accessing genetic resources: international law establishes multilateral system. Genetic Resources and Crop Evolution 51(6): 609–620. Fowler C. Hodgkin, T. 2004. Plant Genetic Resources for Food and Agriculture: Assessing Global Availability. Annual review of environment and resources 29:143–79. Frankel OH, Soulé ME. 1981. Conservation and Evolution. Cambridge University Press, Cambridge, UK, 327 p.
Gams W. 2002. Ex situ Conservation of Microbial Diversity. En: Sivasithamparam K, Dixon KW, Barrett RL, (eds.) Microorganisms in Plant Conservation and Biodiversity, Kluwer Academic Publishers, Springer Netherlands, 1ª ed., pp. 269–283. Gibson JP, Ayalew W, Hanotte O. 2007. Measures of Diversity as Inputs for Decisions in Conservation of Livesctock Genetic Resources. En: Jarvis DI, Padoch C, Cooper HD. (eds. ), Managing Biodiversity in Agricultural Ecosystems. Bioversity International, Columbia University Press, New York, pp. 117-140. Gliessman S. 1989. Agroecology: The Ecological Basis of Sustainable Agriculture. 1ª ed., CRC Press, Chelsea, Michigan, USA. Hammer K. 2003. A paradigm shift in the discipline of plant genetic resources. Genetic Resources and Crop Evolution 50(1):3-10. Hammer K, Arrowsmith N, Glasdis T. 2003. Agrobiodiversity with emphasis on plant genetic resources. Naturwissenschaften 90(6):241–250. Harvey CA, Komar O, Chazdon R, Ferguson BG, Finegan B, Griffith DM, Martinez-Ramos M, Morales H, Nigh R, Soto-Pinto L, Van Breugel M, Wishnie M. 2008. Integrating Agricultural Landscapes with Biodiversity Conservation in the Mesoamerican Hotspot. Conservation Biology 22(1): 8–15. Hoffmann I. 2007. Management of Farm Animal Genetic Resources: Change and Interaction. En: Jarvis DI, Padoch C, Cooper HD, (eds. ), Managing Biodiversity in Agricultural Ecosystems. Bioversity International, Columbia Press University, New York, pp. 141-180.
International Plant Genetic Resources Institute, IPGRI. 2003. Home Gardens and the In situ Conservation of Plant Genetic Resources, Rome: International Plant Genetic Resources Institute. En: http://www. ipgri.cgiar.org/system/page.asp?frame=publications/indexpub.htm. International Plant Genetic Resources Institute, IPGRI; Global Facilitation Unit For Underutilized Species, GFAR; M.S. Swaminathan Research Foundation, MSSRF. 2005. La agrobiodiversidad y la erradicación del hambre y la pobreza, cinco años después. Plataforma de Chennai para la Acción, IPGRI, GFAR, MSSRF. Sp. Jenkins M. 2003. Prospects for biodiversity. Science 302(5648):1175–1177. Jones H, Lister DL, Bower MA, Leigh FJ, Smith LM, Jones MK. 2008. Approaches and constraints of using existing landrace and extant plant material to understand agricultural spread in prehistory. Plant genetic Resources: Characterization and Utilization 6(2):98-112. Kessler JJ. 2008. Agro-Commodity Production Systems. Ecoystems 11:283-306. Köhler-Rollefson. 2003. Community based management of animal genetic resources, with special reference to pastoralists. En: Proceedings of the Workshop on Community Based Management of Animal Genetic Resources. A Tool for Rural Development and Food Security, Mbabane, Swaziland, May 7-11, 2001, Rome, FAO, pp. 13-26. Kumar BM, Nair PKR. 2004. The enigma of tropical homegardens. Agroforestry Systems 61(1):135-162. Lambin EF, Turner IIBL, Geist HJ, Agbola S, Angelsen A, Bruce JW, Coomes O, Dirzo R, Fischer G, Folke C, George PS, Homewood K, Imbernon J, Leemans R, Li X, Moran EF, Mortimore M, Ramakrishnan PS, Richards JF, Skanes H, Steffen W, Stone GD, Svedin U, Veldkamp T, Vogel C, Xu J, 2001. The causes of land-use and land-cover change: moving beyond the myths. Global Environmental Change 11(4): 261-269. Lobo M. 2008. Importancia de los recursos genéticos de la agrobiodiversidad en el desarrollo de sistemas de producción sostenible. 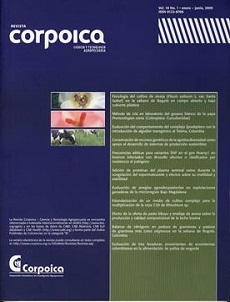 Revista Corpoica 9(2):19-30. Lobo M, Delgado O, Cartagena JR, Fernández E, Medina CI. 2007. Categorización de la germinación y la latencia en semillas de chirimoya (Annona cherimola L.) y guanábana (Annona muricata L.), como apoyo a programas de conservación de germoplasma. Agronomía Colombiana 25(2):231-244. Magos BJ, Maxted N, Ford-Lloyd BV, Martins-Loução MA. 2008. National inventories of crop wild relatives and wild harvested plants: casestudy for Portugal. Genet Resour Crop Evol 55(6):779-796. Maxted N, Ford-Lloyd BV, Hawkes JG. 1997a Complementary conservation strategies. En: Maxted N, Ford-Lloyd BV, Hawkes JG, (eds. ), Plant Genetic Conservation: The In situ Approach, 1ª ed., London, Chapman & Hall, pp. 15-40. Maxted N, Guarino L, Myer L, Chiwona EA. 2002. Towards a methodology for on-farm conservation of plant genetic resources. Genetic Resources and Crop Evolution 49(1): 31–46. Maxted N, Hawkes JG, Guarino L, Sawkins M. 1997b. Towards the selection of taxa for plant genetic conservation. Genetic Resources and Crop Evolution 44(4): 337-348. MEA (Millennium Ecosystem Assessment), 2005. Ecosystems and Human Well-being: Biodiversity Synthesis. World Resources Institute, Washington, DC. Müller J, Friedl T, Hepperle D, Lorenz M, & Day JG. 2005. Distinction of isolates among multiple strains of Chlorella vulgaris (Chlorophyta, Trebouxiophyceae) and testing co specificity with amplified fragment length polymorphism and its RDNA sequences. Journal of Phycology 41(6): 1236–1247. Organización de las Naciones Unidas, ONU. 2008. ACNUR reporta cifra récord de refugiados y desplazados. En: Centro de Noticias de la ONU, http:/www.un.org/spanish/News/fullstorynews.asp?newsID =127398criteria1=refugiados&criteria2=desplazados, consulta: 19 de julio de 2008. Pascual U, Perrings C. 2007. Developing incentives and economic mechanisms for in situ biodiversity conservation in agricultural landscapes. Agriculture, Ecosystems and Environment. 121(3):256- 268. Pattison J, Drucker AG, Anderson S. 2007. The cost of conserving livestock diversity? Incentive measures and conservation options for maintaining indigenous Pelón pigs in Yucatan, Mexico. Trop Anim Health Prod 39(5):339-353. Perrings C, Gadgil M. 2003. Conserving biodiversity: reconciling local and global public benefits. En: Kaul I, Conceicão P, Le Goulven K, Mendoza RL, (eds. ), Providing Global Public Goods: Managing Globalization OUP, Oxford, pp. 532-555. Plucknett D, Williams JT, Smith NJH, Anishety NM. 1992. Los Bancos Genéticos y la Alimentación Mundial. IICA, CIAT. 260 p.
Porcher E, Gouyon PH, Lavigne C. 2004. Dynamic management of genetic resources: maintenance of outcrossing in experimental metapopulations of a predominantly inbreeding species. Conservation Genetics 5(2): 259–269. Rege JEO. 2003. Defining livestock breeds in the context of communitybased management of farm animal genetic resources. En: Community-based Management of Animal Genetic Resources, Proceedings of a workshop held in Mbabane, Swaziland, 2001, (FAO, Rome), pp. 27–35. Rege JEO, Gibson JP. 2003. Animal genetic resources and economic development: issues in relation to economic valuation. Ecological Economics, 45(3): 319–330. Rice E. 2007. Conservation in a changing world: in situ conservation of the giant maize of Jala. Genetic Resources and Crop Evolution 54(4): 701-713. Ruto E, Garrod G, Scarpa R. 2008. Valuing animal genetic resources: a choice modeling application to indigenous cattle in Kenya. Agricultural Economics 38:89-98. Sampson RA, Stalpers JA, Van Der Mei D, Stouthamer AH. 1996. Culture collections to improve the quality of life. 1ª ed., (Centraalbureau voor Schimmelcultures: Baarn). Scarrascia-Mugnozza GT, Perrino P. 2002. The history of ex situ conservation and use of plant genetic resources. En: Engels JMM, Ramantha Rao V, Brown AHD, (eds. ), Managing Plant Genetic Diversity, 1ª ed., Oxford, Cabi Publishing, pp. 1-22. Schröder S, Begemann F, Harrer S. 2007. Agrobiodiversity monitoring – documentation at European level. Journal of Consumer Protection and Food Safety. 2(Supplement 1): 29–32. Smale M, Bellon M, Jarvis D, Sthapit B. 2004. Economic concepts for designing policies to conserve crop genetic resources on farms. Genet Resour Crop Evol 51(2):121-135. Talle SB, Chenyabuga WS, Fimland E, Syrstad O, Meuwissen T, Klungland H. 2005. Use of DNA technologies for the conservation of animal genetic resources: A review. Acta Agriculturae Scandinavica, Section A – Animal Science 55(1): 1-8. Tao KL. 2001. Complementary conservation strategy for plant genetic resources. Chapter 5. En: Saad MS, Rao VR, (eds. ), Establishment and management of field genebanks. A training manual. Roma, IPGRI, APO, pp. 46-53. Thomas CD, Cameron A, Green RE, Bakkenes M, Beaumont LJ, Collingham YC, Erasmus BFN, De Siqueira MF, Grainger A, Hannah L, Hughes L, Huntley B, Van Jaarsveld AS, Midgley GF, Miles L, Ortega Huerta MA, Peterson AT, Phillips OL, Williams SE. 2004. Extinction risk from climate change. Nature 427:145–148. Tilman GD, Duvick DN, Brush SB, Cook RJ, Daily GC, Naeem S, Notter D. 1999. Benefits of Biodiversity. Council for Agricultural Science and Technology. Council for Agricultural Science and Technology. Iowa, CAST. Ames. Tindall BJ. 2007. Vacuum drying and cryopreservation of prokaryotes. En: Day JG, Stacey GN, (eds. ), Cryopreservation and freeze-drying protocols (Methods in molecular biology: vol. 368), 2ª ed., Humana Press, Totowa, NJ. USA, pp. 73-98. Walters C, Wheeler L, Stanwood PC. 2004. Longevity of cryogenically stored seeds. Cryobiology 48(3): 229–244.